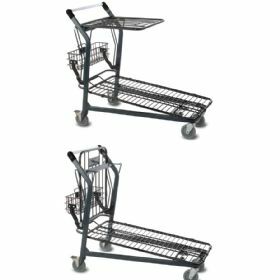 The latest in multi-purpose cart innovation. Flat retractable top allows for comfortable unpacking and easy access to the lower level for both customers and employees. Its superb nesting saves valuable space and its durable design easily carries up to 800 lbs. Rear wheel brakes stops cart from rolling. Available in Dark Gray & Black VersaCoat finish- a high quality powder-coating. Available with 4-way swivel or standard casters, 2 swivel, 2 rigid. Please specify color and wheel preference. Measures 45"L. x 23"W. x 41.25"H. Ships UPS. FOB Shipping Point. 19"W x 5.5"d. x 6"H.
Picture shown with optional Rear Basket Attachment.